AP reporters shot in Afghanistan Jump to media player Two female journalists working for the Associated Press news agency have been shot by a police officer in eastern Afghanistan, officials say. 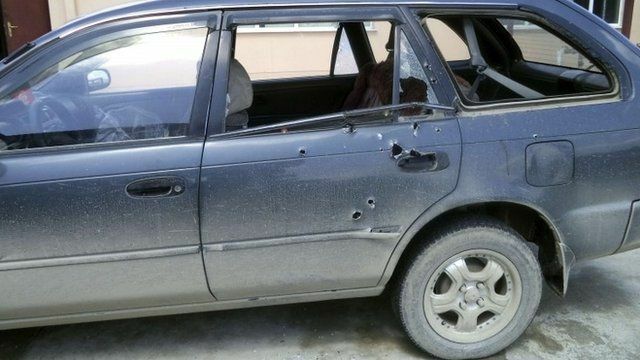 Female reporters shot in Afghanistan Jump to media player Two female foreign journalists have been shot by a police officer in eastern Afghanistan, officials say. Poll safety and logistical challenge Jump to media player As Afghans prepare to cast their votes in the presidential election, organisers face security and logistical challenges. Taliban's war on Afghan women Jump to media player As Afghanistan prepares to go to the polls, women in particular are feeling threatened by Taliban threats to attack voters. Two female journalists working for the Associated Press news agency have been shot by a police officer in eastern Afghanistan, officials say. One of the women, Anja Niedringhaus, died in the attack. Her colleague, Kathy Gannon, is reported to be stable. The journalists were travelling with election workers delivering ballots in Khost province, near the Pakistan border. The BBC's David Loyn knew both women personally.